A successful record producer from Belfast has launched a new storytelling bursary to support people hoping to train in this ancient tradition and to increase opportunities for people young and old to hear stories right across Northern Ireland. Roger Armstrong helped found Ace Records in London in the 1970s, which has released more than 5,000 records. Now he is launching the Armstrong Storytelling Bursary in honour of his parents Peg and Jim Armstrong. The story all began in the 1980’s when Roger’s mum and dad met Liz Weir, who was running a Yarnspinners storytelling group, prompting them to form their own group at Tullycarnet Library. In honour of his late parents, Roger set up the initial storytelling residency with Libraries NI. After two years of programming with Libraries NI he feels it’s time to expand its scope and having invested his own money he hopes to involve interested members of the business community. Storytelling has huge benefits: it can improve children’s literacy and communication, engage with people with dementia and help companies improve their management skills. Roger hopes that other business leaders will join him now and he has set up a community interest company (CIC) that will fund the development of new storytellers and reach thousands of people in Northern Ireland. He said: “We have the personnel and project in place but need further finance to roll it out on a bigger scale. “Storytelling is a vivid and immediate way to entertain, engage and inform people but it’s much more than that. It teaches core life skills, communication, confidence, critical thinking and empathy. The bursary is cross community and is also dedicated to bringing stories from around the world to Northern Ireland, introducing people from different cultures and experiences to entertain the public. 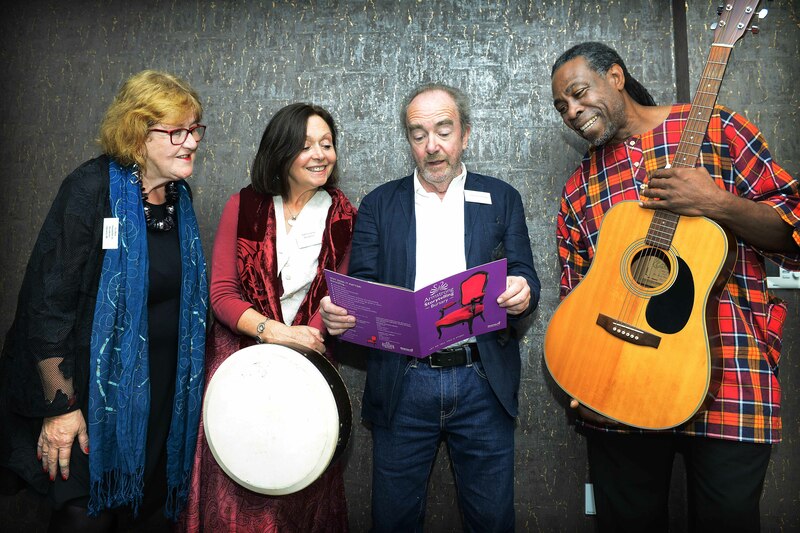 In the pilot project run over the last two and a half years, the funding provided by Roger meant that 15,251 people listened to stories told by 32 different people and a further 437 people received storytelling training. Liz Weir, Northern Ireland’s leading storyteller, has a long and colourful career in which she’s told stories to literally thousands of people of all ages, trained up and coming storytellers and even worked with leading stage actors and a raft of big businesses to improve their communications skills. Fellow storyteller Pat Ryan, an educator originally from the US, has been teaching storytelling to everyone from schoolchildren to premiership footballers and coaches. He believes it is essential for this tradition to continue. “Teachers had been required to teach half an hour of storytelling. This is something that is no longer on the curriculum but we are helping to bridge that gap. We go into schools and tell stories but we also teach the young people to tell their own stories. Many of them have never spoken before a group and this can be the first step in developing an essential life skill,” Pat said.